About 200 more people were killed by distracted driving versus drunk driving in Colorado, making distracted driving the leading cause of fatal traffic accidents in the state. This shocking finding, which unseats DUI as the number one cause of deadly accidents, has led many law enforcement agencies in Colorado to initiate distracted driving campaigns to try to curb this deadly behavior. The hope is that these distracted driving campaigns, which include stepped up enforcement, along with public education, will be as effective as anti-drunk driving campaigns have been in reducing the incidence of impaired driving. With distracted driving surpassing DUI as the leading cause of deadly car accidents, a Littleton car accident lawyer discusses why distracted driving is so dangerous. The statistics regarding distracted driving are chilling, as they reveal just how frequently motorists are not paying attention – and just how often this carelessness leads to crashes, injuries and deaths. Distracted driving contributes to about 23 percent of all traffic accidents in the U.S. In 2013, distracted driving killed more than 3,150 people and injured about 424,000 others. 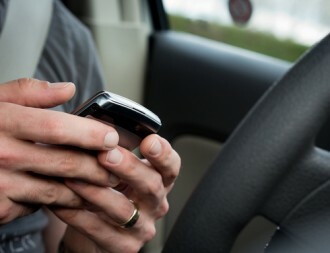 The number one distraction for drivers is mobile devices, particularly texting while driving. Texting while driving is about six times more likely to cause a traffic accident than drunk driving. While the news that distracted driving is the leading cause of fatal traffic accidents in Colorado may be surprising on the surface, taking a closer look at the nature of the impairments this driving behavior causes can really elucidate just why distracted driving is so dangerous and deadly. Spend an average of 10 percent of their driving time outside of their lanes of traffic. Ironically, these impairments are similar to those exhibited by drunk drivers. If you have been hurt in a traffic accident caused by negligence or recklessness, contact an experienced Littleton car accident lawyer at Bahr, Kreidle & Flicker to find out your best options for financial recovery. Since 1983, the Littleton personal injury attorneys at Bahr, Kreidle & Flicker have been fighting on behalf of injured people and aggressively standing up against injustice, inequality and intolerance. Our lawyers know how serious and devastating the impacts of personal injuries can be. That’s why we are committed to advocating injured people’s rights, helping them hold negligent parties responsible and ultimately getting them the highest possible awards for their injuries and losses. To get more information about your best options for financial recovery, contact us today and attend a free, no obligations initial consultation with one of our lawyers. To set up a meeting, call us at (303) 794-7422 or email us using the form on this page.